Helen McGovern’s walking group took a hike down the Eagle Trail from Albany’s Takena Landing Park last week. Then she sent me a note: “Thanks to whoever cleaned up the trail. It was a pleasure to do the hike.” I went to see for myself, and she’s right. The trail is in great shape. 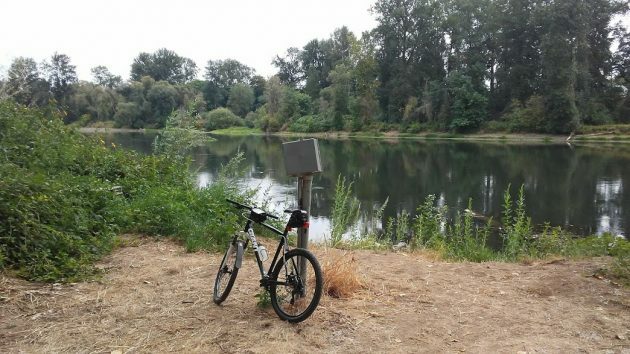 The 1.8-mile Eagle or Takena Landing trail meanders down the left bank of the Willamette River. It starts under the Lyon Street bridge and ends in a short loop roughly where Bowman Park is on the opposite bank. If memory serves, its name stems from a boy’s Eagle Scout project. Then-Governor Kitzhaber once led local cross-country teams on a run there during one of his first two terms. In winter, the river occasionally floods sections of the path. But in summer it lies far above the water level, and for most of its length the dense undergrowth obscures any views of the river itself. So what about this cleanup? “Park maintenance did it this time with the sheriff’s work crew,” Rick Barnett of the Albany Parks Department told me when I asked. 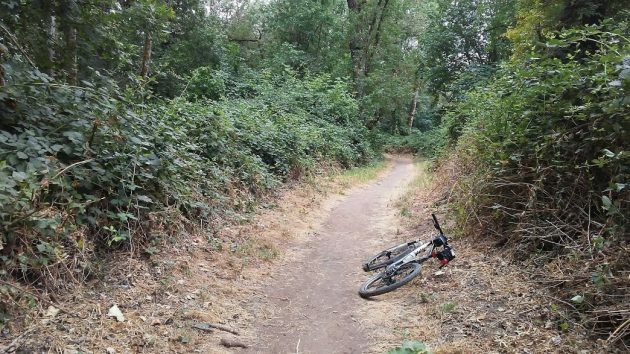 The trail usually needs going over twice a year, once to remove downed trees after the river goes down in the spring and again right about now to cut back vegetation that otherwise would choke the unpaved path. Berry vines have been cut back to leave a nice wide path on the Eagle Trail. One of the few places off the trail where you can see the Willamette. The trail was built when Dave Clark was still alive. Several volunteered and we followed a small cat or tractor blazing the trail. We found lots of golf balls some colored. It was fun and I am glad it didn’t get overgrown again. The city later added some gravel. There were all ages. The kids collected most of the golf balls. Thanks Dala for your remembrance of the fun times and dozens of projects you and Dave used to do for the city. You are such a valuable person for Albany because of the good and dirty jobs you have done. I appreciate you so much and Dave did too! Thanks to Hasso for keeping us informed of issues that the newspaper would never tell us. You are appreciated too! Thanks to the Eagle Scouts for their work making the trail, you too are appreciated!